This stunning cut crystal wine goblet is acccompanied with a miniature bottle of red wine in this gift set! 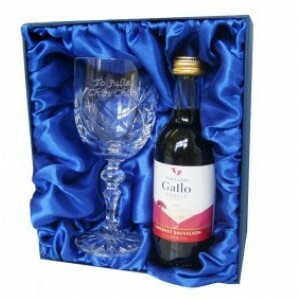 The crystal wine glass can be engraved with any message up upto 3 lines, 20 characters per line including spaces. It makes a perfect gift for any lover of white wine and great for any occasion. It also comes boxed in a blue silk lined presentation box.